If a WordPress plugin isn’t updated regularly, it may be considered abandoned. Abandoned plugins can be a security threat and will eventually stop working as it loses compatibility. The developer doesn’t have the time to work on it. The developer is no longer interested in it. Supporting a free plugin becomes difficult. If you maintain a lot of plugins, it can hard to keep up with all of them. You may not be able to update on time or respond to support tickets, and ultimately your plugins go unmanaged and become abandoned. After seeing a lot of abandoned plugins, the core team found a way to give them a second life. If you’re ready to let a plugin go to a new developer, use the tag “adopt-me,” and it will be taken over. Plugin adoption is one of the best ways to contribute to WordPress. If you see a plugin you think you could improve, consider taking it over. It’s a great option for someone who doesn’t have time to build an original plugin from scratch but still wants to get involved. You can find out the plugins available for adoption here. The concept of plugin adoption is not new, but very few people know about it. Sometimes, people may not be willing to adopt someone else’s code. Instead, they want to start with their own. But a pre-existing audience can help you get a kick-start. Instead of abandoning a plugin that you do not feel excited about anymore, you can just put it up with other plugins to be adopted. Add an adopt-me tag to the readme.txt. Add a description for developers explaining how they can reach out to you. It is always a good practice to blog about your intentions, more about it below. No hard and fast rule has been described yet to notify about the abandoned plugins. What you can do is add the ‘adopt-me’ tag to the list of plugin tags inside the readme.txt file. And your plugin will show up on the page as seen below. Widgetable is one of the plugins which is currently available to be adopted. Here in the sidebar, you can see adopt-me being shown with all the other tags. Now if I open its readme.txt file, you’ll find the adopt-me tag. How to Adopt a Plugin? Contact the Developer Directly: You can communicate with the plugin author directly and ask for an adoption. Contact the Plugins Team: If you fail to get an answer, then you may contact the WP plugins team directly. Fork the plugin and try to add some changes in its code. Then send your code specimen through an email to [email protected] If your changes are approved by the team, they’ll contact the plugin author and handle things on their behalf. Advertising Plugin Abandonment: Another great way of promoting adoption is to encourage authors to advertise about their plugins. Recently, my friend Tom wrote a blog post (WordPress Plugin Adoption: Would You Like One?) where he listed his plugins for adoption. He asked all the interested folks to submit their adoption request via a contact form and added a deadline to it. Overall, I think the best way to publicize about plugin adoption is to add a brief note in the plugin description that your plugin is open for adoption. You can also add a link to an appropriate place where interested people can reach out. There is a complete list of plugins which are looking for a maintainer. 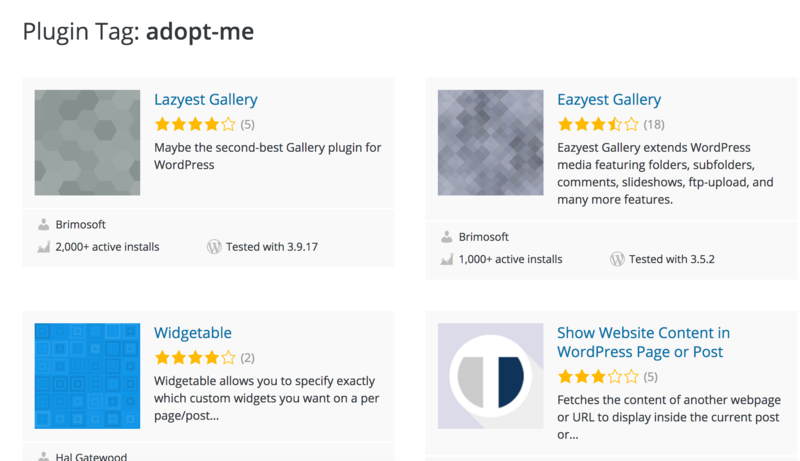 Check out the plugins tagged adopt-me and choose one for yourself. Not only this, there are several other plugins which are without this tag and have not been updated for years. You can adopt them as well. Just reach out to their developers and have a talk. I think you should give up your plugins if you can’t take care of them. Just add an adopt-me tag and let someone else takeover. For the sake of its users, this is the right thing to do.